Email marketing is an essential part for every conversion optimization strategy. It has long been used to reduce cart abandonment, increase returning customers and of course build and maintain a relationship with customers. Email marketing also has a large return of investment and over 86% of subscribers say they find them useful. In fact, the percentage of people deleting email before reading them has gone done from 60% to 40% in the last 4 years (statista). Clearly there is much in it for brands to collect email subscribers and grow their lists, but what’s in it for the subscribers? In late 2014, research showed that 80% of consumers signup to email lists to receive discounts. Others said they signup to receive exclusive offers and updates. 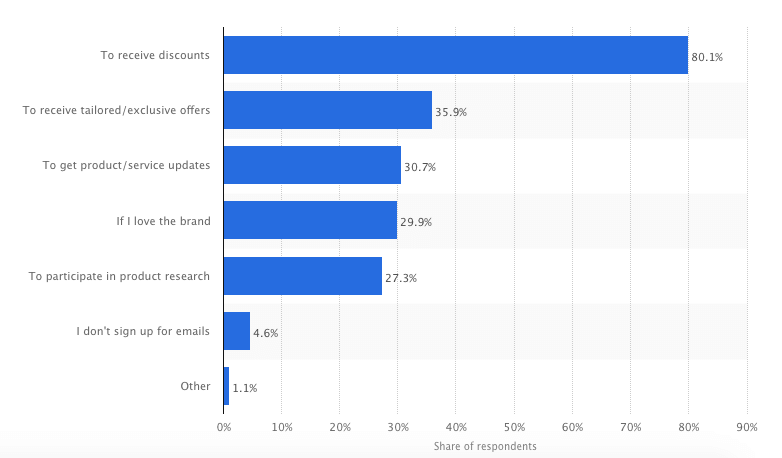 However, 53% of marketers planned to increase their email marketing budget in 2015 which means there is a lot of competition for your customer’s attention. Many brands are trying to convert your customers and sign them up for their list which is why before asking people to subscribe to your newsletter list, you must have a clear strategy that shows customers exactly what’s in it for them and why they should choose you over others. There are many reasons for brands to grow their email lists, but what’s in it for the subscribers? 2. What you lose – This strategy capitalizes on the emotional trigger - “Loss Aversion” which focuses on the fact that the pain of losing something is stronger the happiness of gaining something. Basically – people don’t want to miss out so by telling potential subscribers what they could be losing you can increase signups dramatically. 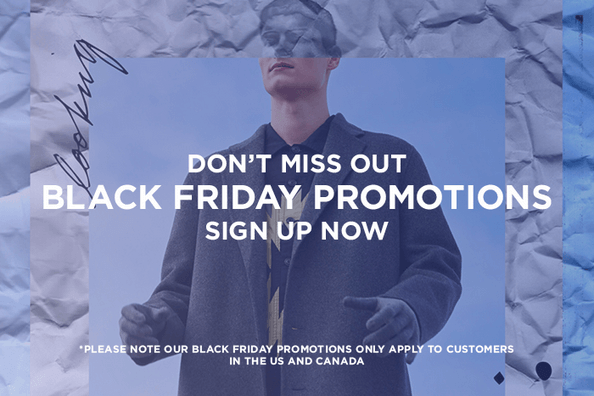 Examples include: “Don’t lose the last minute sale” or “Just 5 items left in stock!” and “For 24 hours only” – all these examples affect customers in a way that increases conversion rates. One of the most common ways of attracting email subscribers is by using pop ups and in this post we’ll discuss the types of pop ups you can use and how to optimize them. As I’ve said before, when it comes to optimization, opinions do not matter. Though most people agree with me, when it comes to popups, people need an occasional reminder, like it or not, they work. Countless businesses have successfully used pop ups to reduce bounce rate, cart abandonment and increase engagement and yet people still dislike them. 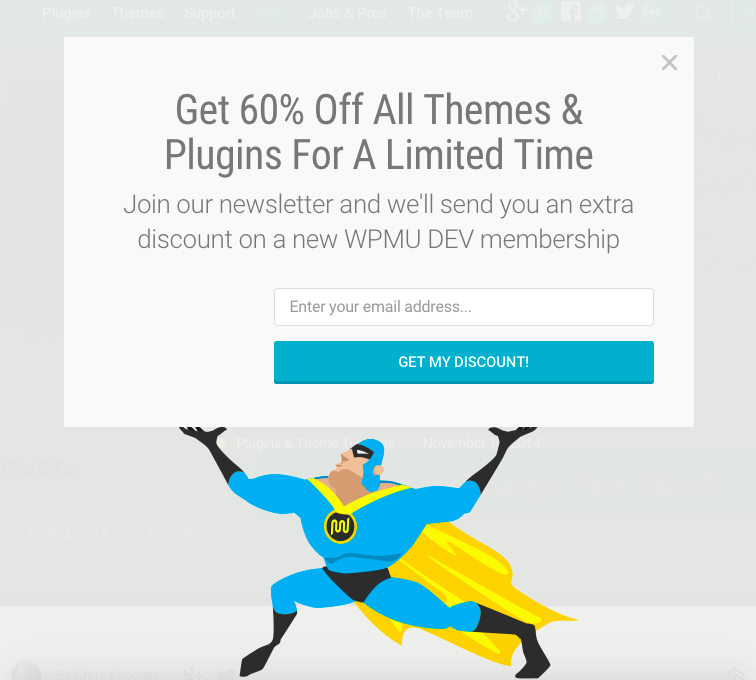 Similar to any other tool or method, popups can be done very well or very poorly. The reason most people dislike pop ups is because many websites abuse them and execute them in a very poor way. For example, many companies use automatic system popups that disrupt the user journey and force visitors to react. Not what we’re going for here. 1. Exit intent pop-ups – these pop ups show up when a visitor moves their cursor outside of the browser window and intends on leaving the site. There’s no need for them to hit the “x” to see it, simply moving their mouse will trigger it. 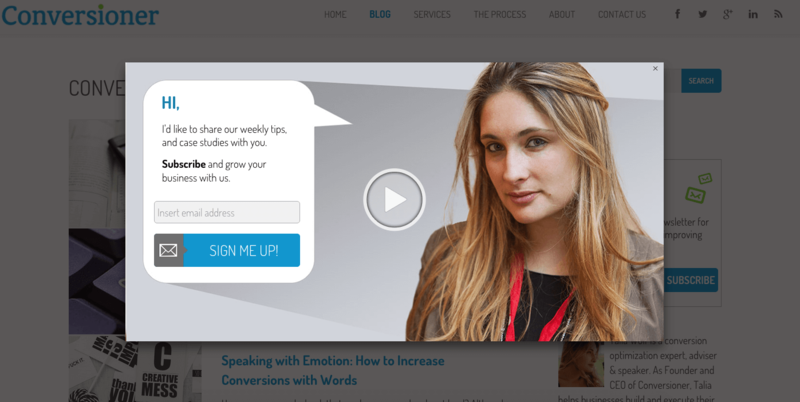 At Conversioner we use an exit intent pop up to offer actionable tips on emotional conversion optimization and invite customers to join our community (check out its results here). Since we started using an exit intent pop up we’ve seen an increase of 76% in newsletter registrations. 2. Scroll-based pop ups -These pop ups are configured to show up once a visitor has scrolled a certain percentage of the page. 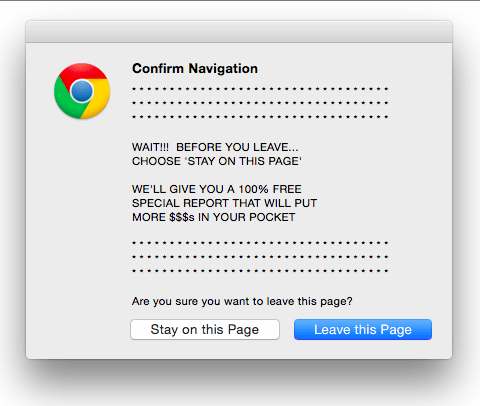 These pop ups are designed for minimum intrusion and better targeting. 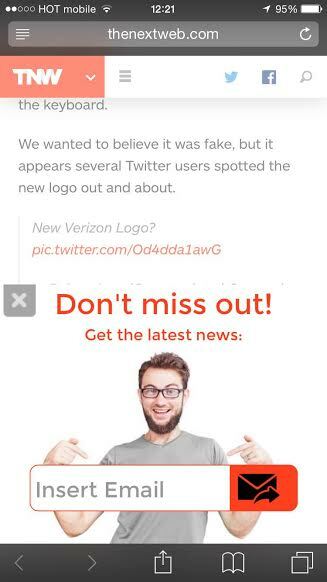 For instance, for The Next Web we designed a pop up that is shown to visitors who have scrolled 30% of an article. This way we know these readers are more relevant, interested in our content and more likely to sign up. 3. Time based pop ups: these type of pop ups are timed to appear after a certain amount of time a visitor has spent on a site. Many E-commerce sites use this technique to target customers who are more likely to buy since they spend more time on the site. Timed based pop ups are commonly used on checkout pages and blog pages to target the more interested visitors and are usually segmented according to behavior, for example first time visitors, or returning. 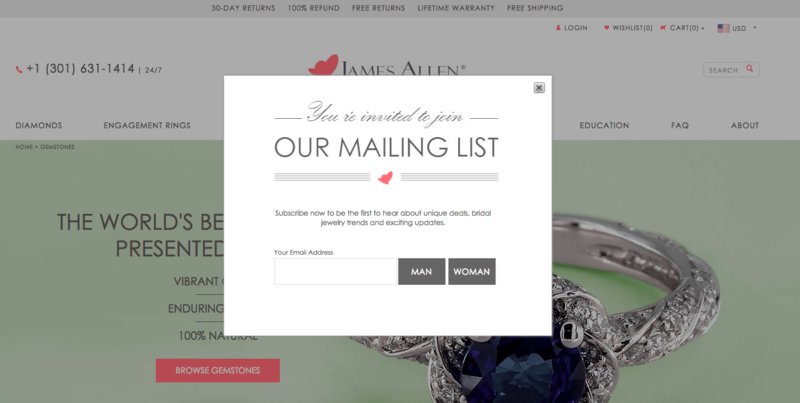 - Probably the most common pop up used for collecting emails, an entry pop immediately shows up once a visitor lands on a site and invites people to sign up to a newsletter. Skreened does a great job with their strategy (Here’s what you get – 15% off) and its design which is tailor-made to the audience and product. 5. Welcome Mats: Welcome mats are a new way businesses have been collecting emails. It works in a way that once a visitor lands on a site, the welcome mat takes over the entire page and dominates it. On one hand the welcome mat is great for grabbing attention and you have to manually close it in order to skip it. On the other hand, people aren’t expecting it and it’s intrusive which means you have to be very clear and quick with a message that convinces them to sign up before they’ve seen anything. To me, it somewhat resembles the system exit pop we discussed earlier but easier on the eye. Using the first strategy, Sujan Patel highlights the benefits of signing up to his mailing list: Learning the secret behind his success. The welcome mat and strategy increased his mailing list by 3.3%. 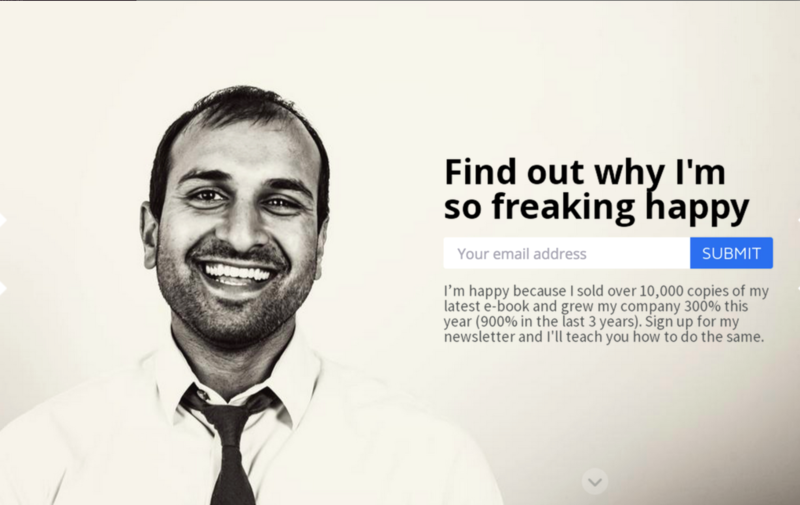 By combining a Welcome Mat with a Hellobar (offering 25 chapters of his ebook for free) and a custom designed pop-up, Sujan Patel increased conversions by – 5.5%. GetResponse – The majority of emails these days are opened on mobile. Which is why it’s important to send newsletters and email campaigns that are mobile first. Get Response offers a cool and easy product for making mobile first emails and as a results increasing conversion rates. Though many competitors offer a mobile preview of a newsletter, each device sees the email differently. By designing your newsletter mobile first, you’re ensuring a better user experience for your subscribers. To increase your email list one of the most important parts is understanding what you have to offer in return, meaning – what’s in it for your customer. Our crowded inbox is hard to navigate through and 40% of subscribers still delete emails before even reading them. It is vital to show our customer the value the get and then keep create that value. But, even more important to remember is that signing people up to your mailing list is just the first step of many, the next is proving your worth and delivering content that customers care for and want, promises don’t mean much if you don’t deliver. What are some techniques you use to grow your mailing list?